If you are missing most or all of your teeth, dentures can improve the appearance of your smile and allow you to eat and speak more comfortably. Along with dental implants, dentures are one of the most common full mouth reconstruction procedures that Dental Restorative Group in Belmont, Cambridge, and Greater Boston offers. The prosthodontists in our practice specialize in treatments that restore tooth and jaw structures. Just as important as our expertise is the care and personal approach we offer. Our doctors frequently help seniors in Belmont, Cambridge, and Greater Boston improve their comfort and quality of life with dentures and other services. Learn more about our work and the time, attention, and support we give to each patient. Dentures are removable dental appliances designed to replace most or all of a full arch of teeth. 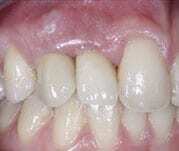 Typically, upper dentures rest directly on the gums and stay in place with special adhesive. Dental Restorative Group recommends implant-supported dentures for the lower teeth. These appliances attach to two or more dental implants in the gums, which makes them stronger and more stable. Chew food more comfortably. Dentures restore some of the strength that your natural teeth had, allowing you to eat foods you may have had to give up previously. Smile more confidently. The dentures that our doctors create offer a natural-looking replacement for missing teeth. Appear more youthful. 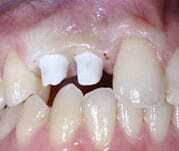 When you lose teeth, your face may take on a sunken appearance. Dentures return structure to the mouth and instantly improve this concern. During an initial visit to our Belmont, Cambridge, or Arlington offices, your doctor will conduct a comprehensive examination, talk with you about the concerns that you have with your teeth, and describe treatment options. If you need to restore most or all of your teeth, you are likely a good candidate for one of two approaches: dental implants or dentures. While dentures are a removable appliance, dental implants use a man-made tooth root to anchor one or several tooth-shaped crowns. They may be more affordable to you. Even though they may cost less, dentures can restore the aesthetics of your smile in a natural-looking way. Implants help to prevent bone resorption, the erosion of bone from the area of missing teeth. While you can brush and care for dental implants just as you would your natural teeth, dentures require ongoing maintenance and cleaning. Dental implants may feel more like your own teeth since you don’t have to remove them at night. For some Belmont, Cambridge, and Greater Boston patients, this is a valuable emotional benefit. If you decide that you want dentures rather than dental implants, your doctor will take X-rays, conduct CT scans of the area, and create impressions of your teeth and gums. The doctor can also talk to you about different configurations and materials for your new teeth. Patients in Belmont, Cambridge, and Greater Boston who are getting dentures for the first time may receive a temporary set of dentures. This can improve the functionality and appearance of your teeth while your permanent dentures are fabricated. In an initial surgery, your doctor will place the implants in the lower jawbone at the front of the mouth, where most patients have greater strength and stability. Local anesthesia will help you feel more comfortable throughout the procedure. Over the next few months, the bone and implants will fuse together and create a stronger foundation. In a second, follow-up procedure, your doctor will expose the top of the implants. A couple of weeks later, the doctor will place abutments on the implants and take an impression of your gums, which is used to make the dentures. When the lower dentures are ready, your doctor will place a metal bar on the abutments and connect the dentures to it. The doctor will also ensure a proper and comfortable fit. Dental Restorative Group can provide you with complete guidelines for cleaning and caring for your dentures, and our office is available to make any adjustments you require along the way. Learn more about getting dentures in Belmont, Cambridge, and the Boston area. Schedule an appointment with Dental Restorative Group online or by phone.